JERUSALEM (AP) — Israel’s military fortified its troops in the West Bank and placed forces on high alert Saturday, a day after a Palestinian stabbed to death three members of an Israeli family and some of the worst Israeli-Palestinian clashes in years erupted over tensions at the Holy Land’s most contested shrine. Following a relatively quiet day, violence resumed late Saturday near the epicenter of the current crisis in the Old City of Jerusalem. After hundreds of Muslim worshippers defiantly held their evening prayers outside the Jerusalem holy site, resuming their protest against security measures Israel imposed after a deadly attack there, clashes unfolded with police firing tear gas and water cannons to disperse protesters. No injuries were reported, but one Palestinian was killed in uncertain circumstances in other low-level clashes that took place throughout the day, including in the West Bank village of the 20-year-old Palestinian assailant who carried out the grisly stabbing spree. His father said he believes his son was motivated by a desire to protect the “honor” of the Jerusalem holy site. Disputes over the shrine, revered by Muslims and Jews, have set off major rounds of Israeli-Palestinian confrontations before. They were also at the root of the current violence which began last week when Arab gunmen fired from the shrine, killing two Israeli policemen. In response, Israel installed metal detectors at the gates of the 37-acre (15-hectare) walled compound, saying the devices were a needed security measure to prevent more attacks and were deployed routinely at holy sites around the world. Muslims allege Israel was trying to expand its control at the Muslim-administered site under the guise of security — a claim Israel denies — and launched mass prayer protests. On Friday, tensions boiled over and several thousand Palestinians clashed with Israeli security forces in the West Bank and in Jerusalem after noon prayers — the centerpiece of the Muslim religious week. Three Palestinians were killed and several dozen wounded in some of the worst street clashes in two years. Late Friday evening, a Palestinian identified as Omar al-Abed jumped over the fence of the Halamish settlement and entered a home, surprising a family that was celebrating the birth of a new grandchild during their Sabbath dinner. The Israeli military said the assailant killed a man and two of his adult children, while his wife was badly wounded. Their daughter-in-law hid in a separate room, sheltering her young children. A neighbor, an off-duty soldier, heard the screams, rushed to the home and opened fire, wounding al-Abed who was taken to an Israeli hospital, said the head of Israel’s rescue service. Itai Orayon, a medic, said he found “blood everywhere” in the house. He told Israel’s Army Radio that three people were on the floor, unconscious “with deep stab wounds all over their bodies,” and that the medical team was unable to save them. TV footage showed the floor tiles drenched in blood. The victims have yet to be named. On Saturday morning, Israeli troops searched the assailant’s family home in the West Bank village of Kobar and detained one of his brothers, the army said. Video footage released by the military shows soldiers leading away a handcuffed and blindfolded man. The army said soldiers searched the house and measured it in preparation for demolition. Anticipating this, local residents said the family emptied its home of valuables. 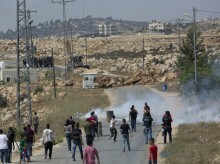 Later, clashes erupted as residents burned tires and hurled rocks at Israeli troops who had searched the home. The military says about 50 people attacked troops who fired back with rubber bullets and tear gas. The assailant’s father said his son had been angered by the escalating violence at the Jerusalem shrine, known to Muslims as the Haram al-Sharif, or Noble Sanctuary, and to Jews as the Temple Mount. Ibrahim al-Abed, an uncle of the assailant, said his nephew had been arrested three months ago by security forces of Abbas, the Palestinian leader who presides over autonomous enclaves in the Israeli-occupied West Bank. The uncle said his nephew had spent two weeks in detention and was violently interrogated about alleged plans to attack Israelis before he was released. The assailant said in a pre-attack Facebook post that he expected to be killed in the attack. He wrote that he wanted his body to be covered by a banner of the Islamic militant group Hamas. Israel has repeatedly accused Abbas and his Palestinian Authority of permitting anti-Israeli incitement in the public Palestinian discourse. Abbas has rejected Israeli incitement allegations, saying Israel’s 50-year-old occupation of lands sought for a Palestinian state is at the root of widespread Palestinian anger and helps drive violence. Abbas is a staunch opponent of violence and in 12 years in power has stuck to security coordination between his forces and Israeli troops against a common enemy — Hamas. On Friday evening, Abbas announced that he would “freeze” ties with Israel “on all levels” until the metal detectors are removed from the shrine, but did not say whether this means halting security coordination. Ending such ties would have far-reaching repercussions and sharply raise tensions with Israel. Yossi Kuperwasser, a former director general of the Ministry of Strategic Affairs, said these were likely empty words since the cooperation is “most of all important for the Palestinians”. Even if largely meant for domestic Palestinian consumption, the Abbas announcement dealt a setback to fledgling efforts by the Trump administration to revive long-dormant Israeli-Palestinian talks on a peace deal. Such efforts now seem moot as Israelis and Palestinians refuse to budge in the showdown over the shrine and violence threatens to escalate. Israeli officials have said they would guarantee continued access to Muslim worshippers but have not said how huge crowds could speedily pass through metal detectors during busy periods. Late Saturday, Israel’s Channel 2 TV reported that police would soon place an “alternative” to the detectors in an effort to lower tensions.